Found on the fringes of the beautiful Peak District National Park, Shrigley Hall Hotel, Golf and Country Club is a golfers paradise. The fabulous 4* Victorian Country house provides the perfect setting for those looking to enjoy the tranquillity of their surroundings from truly luxurious accommodation. Shrigley Hall’s glorious 18-hole championship golf course was designed by famous architect Donald Steel, winding through enchanting woodland and open parkland, it provides a wonderful test for golfers of all abilities. The course has earned a reputation as one of the best in Cheshire and a chance to play here is not one you should pass by. Book a Last Minute Deal at Shrigley Hall Hotel, Golf and Country Club now from £80.00pp! 25% off clubhouse beverages for groups of 12 or more! 1 in 12 goes free! The par 3, 8th hole is the renowned as Shrigley Hall’s signature hole and you will not disagree with this upon playing the course. The short par 3 measures in at 158 yards from the white tees and plays slightly downhill. The green is set back amongst the beautiful trees that inhabit the peak district meaning accuracy is imperative if you want a chance of making birdie here. The putting surface also has another defence, as well as trees flanking it there is also a small water hazard in front so club selection is key when looking to find the green on this short but testing par 3. In typical Donald Steel fashion man made water hazards on the course are scarce and instead he uses the natural layout of the land to create a challenge for golfers. The narrow fairways and small green make are designed to challenge not only a player’s physical ability but also their course management capabilities as a lack of length has been substituted for tricky greens and minimal bail out areas off the tee. However, the lack of length means that the course is manageable for golfers of all handicaps meaning that enjoyment for your whole group is guaranteed. In the past, Steel has been commissioned to advise on alterations to every course currently on the Open Championship rotation, which is testament to his reputation within the design industry. The beautiful course weaves its way through the glorious landscape and gifts players with some incredible vantage points from which the stunning scenery can be observed. The 150 bedrooms that comprise Shrigley Hall's hotel are all superbly fitted and furnished to ensure a pleasurable stay. 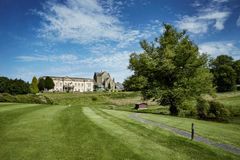 Situated a stone's throw from the glorious Peak District, this is the ideal place not only for a golf break, but also for leisure breaks to explore with family and friends. With a range of different guest rooms, visitors can be assured that there is something to meet all demands, while the excellent access to Manchester and the motorway network makes Shrigley Hall a great choice for many. Having been recognised by local tourist authorities as one of the top local hotels, the quality is undoubted, making it a tremendous host for a golf break. The Bodysense Health and Leisure Club is located inside the hotel itself, and its facilities are comprised of a 14-metre heated swimming pool, well-equipped fitness centre, sauna, steam room, beauty salon and spa, while the hotel also has outdoor tennis courts. The innovative menu has been recognised by an RAC award and the three course dinner at Shrigley Hall Hotel is fantastic. The Courtyard Bar is ideal for sharing a drink with friends and fellow golfers. Comfortable room with good bathroom. Restaurant and bar busy and vibrant. Staff very helpful and friendly. The hotel looks and feels tired, the lock on the room door constantly had an alarm going off every time we left the room ( faulty door handle), the room was a double but felt quite basic. The spa was a disappointment for a number of reasons, firstly the changing rooms were been refurbished so you had to change in bedroom 101 then walk quite a long distance in your swimming trunks to the spa, no dressing gowns were available in the changing rooms , there was no way of locking the lockers so I had to leave my clothes in an unlocked locker, I had to take valuables with me to the pool, the steam room was faulty, I eventually found a member of staff to report it to who told me he knew and someone had been called out, so it was just a case of sauna and pool.The golf course was ok, semi rough was a little long and needed cutting as it was easy to lose a ball only a couple of feet off the fairway, we paid for a buggy which ran out of battery after 9 holes, we changed it but it added 15 mins to our round.The evening dinner was superb although the staff seemed a little lost if not slow, we had to repeatedly ask where drinks we had ordered were, the manager became aware and did in fairness knock one round off our bill. Some challenging and long holes. The course is tricky in places. Definitely need a buggy as there are some long walks from green to tee and also quite hilly. Overall a great experience. Q – What are the check in and check out times at Shrigley Hall Hotel? Q – How much is a buggy and do I need to reserve one? A – There are 30 buggies at Shrigley Hall Golf Club and therefore reserving one is best. Q – When is the best time of year to play Shrigley Hall Golf Course? Q – Do you need a handicap certificate to play golf at Shrigley Hall? A – No you do not need to produce a handicap certificate.